CHICAGO (CNS) — Shara Funches’ eyes scanned the rows of crosses set up on the sidewalk just north of the Chicago River on Michigan Avenue, a main thoroughfare through downtown. Funches was looking for the cross bearing the name of her godson, Devon Almon, 23, who was gunned down on the Eisenhower Expressway Sept. 29. “I had to be here for him. But also for all the kids who died. It just has to stop. It’s just sad. All the mothers, all the fathers, robbed,” Funches said. She was one of hundreds of people who joined a Dec. 31 march on Michigan Avenue organized by Father Michael Pfleger, pastor of St. Sabina Parish on the city’s South Side, to remember those who died by gun violence in 2016. The Chicago Police Department recorded 762 murders in 2016. Father Pfleger told the marchers there were nearly 800 crosses for them to carry. The name of a victim, along with their age and date of death, was written on each 24-inch wooden cross built by Greg Zanis of Aurora, Illinois. Family members and loved ones of victims were joined by strangers who came to bear witness to the toll of the violence that has shaken the community. Vic Doucette, a parishioner at St. Francis Xavier Parish in suburban Wilmette, came with his wife to show solidarity with families who have lost someone to violence. Opening the march, Father Pfleger told the group that the violence will not end until everyone gets involved. “We’re protesting violence,” he said. “Who are we calling to get involved? Everyone . . . every elected official; every government agency; every business and corporation; every mosque and synagogue and church; every law enforcement official; every parent, neighbor and resident; and every citizen from children to elders. Everyone. “We are calling on all of Chicago to take a stand against violence. We are calling on Chicagoans: Get personally involved. We must level the playing field. We need jobs. We need the education system invested in. We need to re-establish police and community relationships. We need community and economic development. We need to make a choice, a decision, against violence. Father Pfleger also called for accountability for gun traffickers and gun shops that make illegal sales. “This is not a West Side problem. This is not a South Side problem. This is a Chicago problem. The reason we’re on Michigan Avenue [is] because this is a Chicago problem. And until everybody in Chicago decides it’s a problem, we’re not going to end it,” he said. Cross-maker Zanis said he was heartbroken by the continuing violence. He has made crosses to remember victims of violence for years, including those killed in the mass shootings in Littleton, Colorado, and Newtown, Connecticut. “I just don’t know what else to do,” he said. 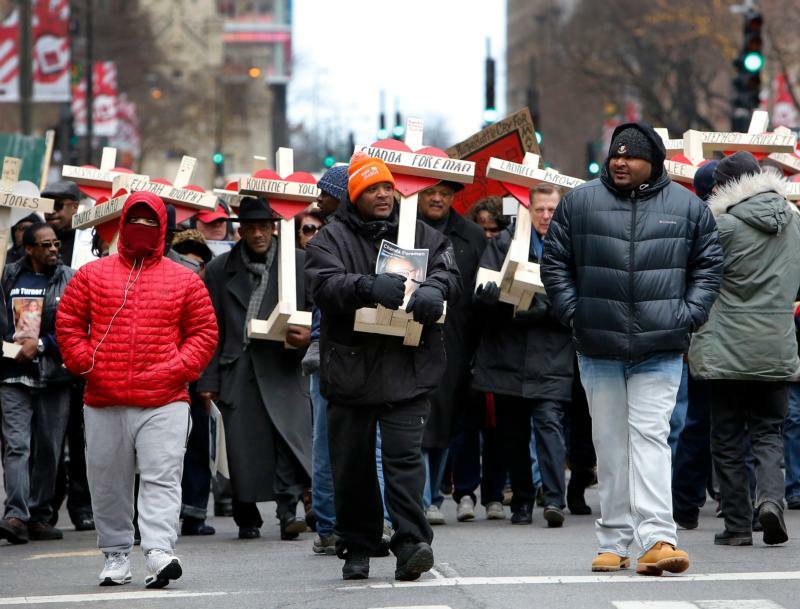 He had planned to display the crosses in Chicago over the New Year holiday, and when Father Pfleger approached him with the idea of the march, he agreed to bring the crosses. The march proceeded in near silence, led by Father Pfleger and others, including the Rev. Jesse Jackson. They took turns reading the list of victims’ names. Larren Davis was astonished by the rows of crosses, some seven deep, waiting to be claimed and carried. Davis’ son, Sentwali Davis, 37, was robbed of his cellphone, shot in the head and left in an alley Oct. 22. Davis said he passed people ice skating in Millennium Park on his way to the march. Dolores Castaneda was among the Catholics who joined the march. She helped carry a banner from the Padres Angeles group at St. Agnes of Bohemia Parish in Chicago. The banner had photos of parishioners recently killed by violence. Father Don Nevins, St. Agnes of Bohemia pastor, said parishioners felt it was important to participate after hosting their own anti-violence march in November. After the march, Father Pfleger said he was heartened by the response.